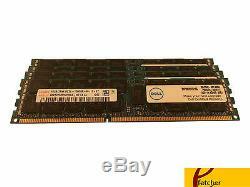 64GB(4 X 16GB) DDR3 1333MHz PC3L-10600 1.35V RDIMM Memory Dell P/N MGY5T, SNPMGY5TC/16G, A5008568. Major brand DIMMs manufactured by Hynix, Micron & Samsung. Compatible with the following Dell models. Dell PowerEdge C2100, C6105, C6145, C6220, M420, M520, M610, M610x, M620, M710, M710HD, M820, M915, R410, R415, R420, R510, R515, R520, R610, R620, R710, R720, R720HD, R820, T320, T410, T420, T610, T620, T710. Dell Precision Workstations: R5500, T5500, T7500, T3600, T5600, T7600. EFetcher's mission is to provide its customers a variety of computer products and excellent service at affordable prices. Over 24 years in business. Over 500,000 satisfied customers. The item "64GB (4 X 16GB) Dell Original Memory SNPMGY5TC/16G For Dell PowerEdge & Works" is in sale since Saturday, November 14, 2015. This item is in the category "Computers/Tablets & Networking\Computer Components & Parts\Memory (RAM)". The seller is "efetchercom" and is located in Lake Forest, California. This item can be shipped to United States, all countries in Europe, all countries in continental Asia, Canada, Mexico, Australia.